How a `Last-Minute' manager conquered procrastination. 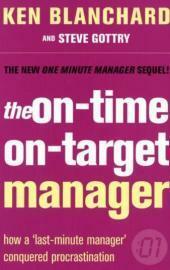 THE ON-TIME, ON-TARGET MANAGER is about how to overcome a diabolical career killer that is lurking out there every day. It's called procrastination. Our story begins with Bob, a typical middle manager, who typically puts things off until the last minute. And as a result, he misses deadlines because his lack of focus causes him to accomplish all the meaningless tasks before he gets to the important things. Bob rationalizes, justifies and tries to explain. But there is an answer - and it's found in the helpful and enjoyable new book. Bob learns to overcome his procrastination by developing a clear picture of where he's been, where he is now, and where he's headed. As a result, he develops the ability to see how poor decisions separate him from good results. And in so doing, he commits himself to real goals, clear ideals, and firm tasks that turn him from a Last-Minute manager into THE ON-TIME, ON-TARGET MANAGER. Ken Blanchard is the founder and Chairman of The Ken Blanchard Companies. His One Minute Manager series has sold over 13 million copies and been translated into more than 25 languages. He has also written and co-authored numerous other books, including Gung Ho!, Big Bucks!, Raving Fans!, The One Minute Apology and The One Minute Golfer.